Bright and colorful Harrison Weir (1824-1906) illustration from 1887 entitled Evening Song. A sweet little bird serenades the setting sun in this cover image from a children’s magazine. The magazine was called The Prize and this was from the June 1888 edition. I’ve not found a great deal about this magazine. One seller on Ebay sold a bound set of 12 and stated it was a “complete” set. However, the one I’m sharing today pre-dates their set; so I’m assuming there were more than 12 released. One miniaturist, who scored several covers, says they were published in the late 1800s and early 1900s. She has taken those covers and created a set of cute little printables to make miniature books. You can find them here on her site. 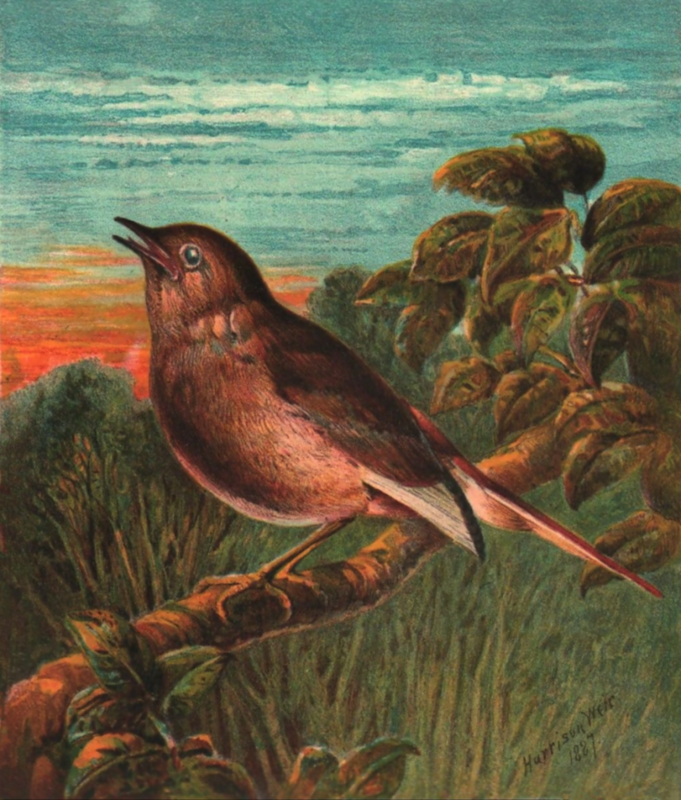 An Evening Song features a brown bird perched upon a tree branch. He’s surrounded by lush green grass and leaves. Off in the distance, the sun is setting in a fiery orange glow in a bright blue sky. Overall, a bright and cheerful illustration.